Berryessa Peak used to be thought the CoHP of Yolo County until it was discovered in the 1990s that Little Blue Ridge is slightly higher. The news was somewhat sad because Berryessa is a much more worthy peak with outstanding views and a dominance of the surrounding terrain. Until six months ago, reaching the peak was a matter of poaching it from one side or the other, for although the summit was on BLM land, the surrounding areas were private property. 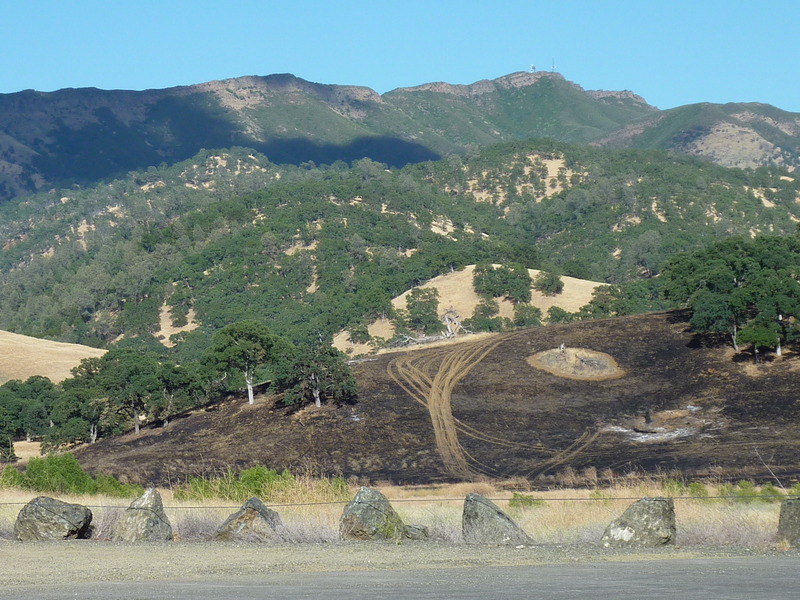 Recently, public access was negotiated with one or more of the landowners on the west side to allow a trail to be built from Berryessa-Konxville Rd to the summit. It was completed just before the end of 2011 and I'd had this hike in mind ever since. I was to meet up with Adam in Sacramento around noon for an extended PNW trip. In order to get this longish hike in along with the two hour drive to Sacramento, I decided to start at the wee hour of 3a. Luckily I had scouted out the start of the poorly marked TH the evening before when there was plenty of light. From the very start it is clear that this is not a well-used trail. The only sign nearby is tacked to a fencepost indicating only the prohibition of motor vehicles. No mention that this is a public access trail. A barbed-wire fence runs along the road to keep the cattle inside. At the access point, the barbed-wire has been replaced by non-barbed wire to make it easier to step over, though no easier to locate the trail. Immediately on the other side one has to guess (or know ahead of time - I had done my research and entered the rough route of the trail in my GPS) just where to find the trail. It is an indistinct path through tall grass that follows eastward up a dry canyon. It soon becomes obvious that a ranch road used to exist here, and indeed it is this roadbed that one follows for the first several miles. The road is shown on the 7.5' topo but it has been many years since it was last driven and has mostly been reclaimed by the annual grasses that the cattle feed on in these parts. In places the trail is more obvious than others, but in general it seems more of a use trail, sometimes hard to tell if people or cows were responsible for its construction. I found the correct turns at several junctions with the help of the GPS, eventually reaching the ascending ridgeline where the trail leaves the old road network and strikes out on its own. Here the trail heads steeply uphill, now better defined once it's no longer following the old road. About half a mile up this ridgeline I started to look for the beginning of the traverse that runs below the crest on the west side. I found some webbing around a tree which I guessed marked the beginning of the traverse. But all I could find to the right of me was a barbed-wire fence without the break I expected. I continued uphill where a fresh sign indicated the Hartwig Ranch. This seemed designed to deter those who overshot the turnoff. I went back down a hundred yards and again searched for an opening in the fence, but found none, and no sign of a trail going off in the correct direction. Later in the day I would find that plastic tubing had been placed over the top two lines of barbs at the crossing point, exactly across from the tree with the webbing on it. A crucial missing detail that ended up costing me. Frustrated, I figured I could just continue up to the crest and find my way south from there. An easy plan to formulate while tired and in the dark, but it wasn't a very good one. It took half an hour to claw my way up the remaining 500ft of gain over less than a quarter mile. Once again, poison oak riddled the hillside and made each step an adventure. When I finally reached the ridge I would have noticed that Berryessa Peak was still some three miles to the south - except that it was dark and I was pretty clueless. Lucky happenstance intervened as I was starting to make my way along the ridge. I spotted an old road just below on the east side that doesn't show up on the 7.5' topo nor on my GPS and suddenly my progress improved from 1/2 mph to four times that. Maybe I'd find my way to Berryessa after all. The new day came on as 5:30a approached. I could see the peak off in the far distance still and wondered how I thought I might just follow the crest there. The old road led to more improved ones, roads that were now depicted on both the map and the GPS. There was some detouring that took me about a mile out of my way, but eventually I got onto a good gravel road following the Yolo/Napa county boundary that would take me to the summit. There was an old camper shell located where one property owner had a primitively developed picnic area. There were nice views east to the Central Valley along they ridgeline. The early morning air was clear enough to see not only Sutter Buttes, but downtown Sacramento to the southeast and even make out the outline of Pyramid Peak and other summits of the Desolation Wilderness area at Lake Tahoe. Sunrise came shortly before 6a, lighting up Berryessa Peak and the crest as I approached it. It was 6:30a before I reached the summit rock atop Berryessa Peak. There are tall summit towers located slightly below the summit, but they did little to mar the splendid views. Ranchlands and Berryessa Lake could be seen to the west, the Central Valley to the east, though currently lost in the glare of the rising sun. I could not locate the benchmark at the highpoint, but found one of the reference marks labeled "MONTECELLO NO. 2" from 1880 when the area was first surveyed. It was not clear during the hike up the road where the junction with the new trail was supposed to be located, so that become my next project once I was done at the summit. Thinking the trail might lead directly to the summit, I wandered north along the crest in search of it. I found an old road that looked promising, though it showed little traffic. It led to a small antenna half a mile from the summit, but went no further. There was no sign of a trail in the immediate vicinity, but I spied what looked like a trail another third of a mile to the north. Rather than continue to thrash my way along the crest, I thrashed the shorter distance down to the road, following that back until I had found the trail junction I'd missed on the way up. Now I would at least be able to use on the way back the trail I could not find in the dark. The trail follows along the crest initially, dropping down to cross a drainage before rising again to traverse just below the crest further north. Though less than a year old, the trail already is starting to look overgrown due to disuse and encroaching shrub. The trail was best where it passes through chaparral, nice and wide. Where it dropped down through heavier brush in the drainage the trail was narrower but required a good deal more work. Wooden steps were set on the north side where the slope is steepest, but they do not appear secure enough to last more than a few years. Where the trail goes across grassy slopes it is weakest, sometimes a barely discernable tread as the new grass is slowly reclaiming it. The track appears to have been laid down quickly here. While I was traversing the grass sections I found the first of more than a dozen ticks that I would encounter before the day was over. Yikes! I returned to the Berryessa-Knoxville Rd just after 9a. A careful search found ticks in the crevices of my pants, on my shirt and elsewhere. One had drawn blood on my arm but fortunately not dug in any further. Others were hiding in my pack and would not reveal themselves until hours or days later. No time to hunt for them now, so I changed into more comfortable clothes and headed out. The drive to Sacramento took longer than expected and it wasn't until 11:30a that I arrived at Adam's home. I unloaded my stuff into his 4Runner and after some more packing we left Sacramento, heading north. It was a long drive to Oregon and North Sister for our first real climb, so I had planned to break up the drive with a short afternoon hike. Cottonwood Peak is a P2K summit to the west of I-5, north of Yreka and about 8 miles from the Oregon border. The effort to reach it is mostly an exercise in driving, the first test for Adam's new car. Leaving the freeway at the small town of Henley, we drove west through an underpass, turned left on the frontage road, then a right onto Ash Creek Rd, also known as Rocky Gulch Rd as well as " Rocky Cluch" road to at least one local resident. The road is rough at the start, but gets better. High clearance is necessary, 4WD a plus. The distance to the peak is less than four air miles from the highway, but with all the switchbacks the mileage exceeds eight miles and took us more than an hour to negotiate; slightly less than an hour on the way out. As the area is prime California logging country, there are many forks along the way and some roads shown on the topo map are no longer navigable. We managed to drive to a recent clearcut (from 2009, according to the sign), less than a thousand feet below, and a quarter mile from the summit. We spent 20 minutes climbing through the detritus of the clearcut to reach the rocky 6,600-foot summit. Along with an old wooden survey tower and benchmark, we found a register left by prolific peakbagger John Vitz from 2004. Many of the names on the five pages were familiar, including Richard Carey and Gail Hanna of San Diego, Dennis Poulin and Andy Martin, Ken Jones, Dan Baxter and Bob Packard. The views were blocked towards the north by trees, but there is a fine view of Mt. Shasta to the southeast. To the west, a line of forest ridges fade out into the distance, all part of the Klamath National Forest. I enjoyed your trip diary for the Berryessa Peak Trail. I hiked the trail yesterday and summited. I find the part of the trail going up Green Canyon to be least groomed, where after following an obvious clear trail, it becomes overgrown or vague and there are no markings of the bed way to get up the ridge. I ended up having to claw and break my way through burnt manzanita trees and waid through green shrubs to make it to the gravel service road. Luckily, I had a really tough pair of hiking pants and a shirt protecting my skin or I would have gotten cuts all over. I suspect it is a hard trail to maintain, but as you mentioned it is only used lightly and there is a charm to its desolate, unmarked character. I wish there were a few more signs for newbies. However, the section leading out of the drainage area and ascent out of Green Canyon to the gravel road really needs grooming or at least markings pointing one through the maze of burnt manzanita trees and shrubs.